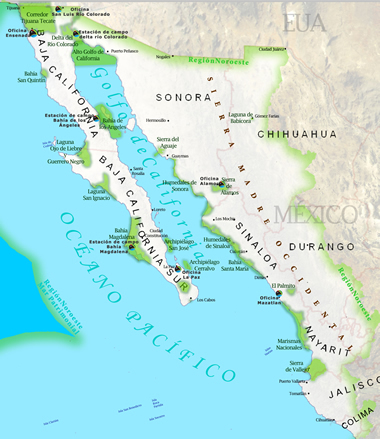 The Gulf of California is one of the most biologically diverse on the planet many of which species are endemic. Not only that but its importance is also reflected socially, politically and economically by the fact that the Gulf of California is the most important fishing area in Mexico, which supplies 75% of the total fishing production in the country. Nevertheless, the Gulf of California has suffered a continuous depletion of its natural resources which has highly impacted fish populations to the extent that are no longer sustainable for the industry. Another big problem is the non-selective fishing gears which affect sensitive species such as marine turtles and the highly endangered vaquita. On the coast, the problems are no less. The coastline all along the Gulf of California is being developed without urban control mechanisms or any sustainable development planning. This rampant development has generated habitat loss for countless species of plants, mammals, birds, and marine mammals, soil contamination, water pollution, over-exploitation of water resources and irreversible changes in the coastline just to mention a few. This Project seeks to help in the protection of the Gulf of California through the systematized supply of strategic information together with risk and sustainability indicators.